Left: Pokka Cleanser. Right: Freshly Squeezed Watermelon and Basil Seed Juice. Left: Bun Thit Nuong Kangaroo. Right: Xa Lach Nicoise. Left: Muc Sua Chien Gion. Right: Pokka Cleanser. Brace yourselves: a new lunch menu at Madame Hanoi is upon us and the selection is mouthwatering to say the least. Lunch menus are rarely as adventurous and diverse as the one at Madame Hanoi. 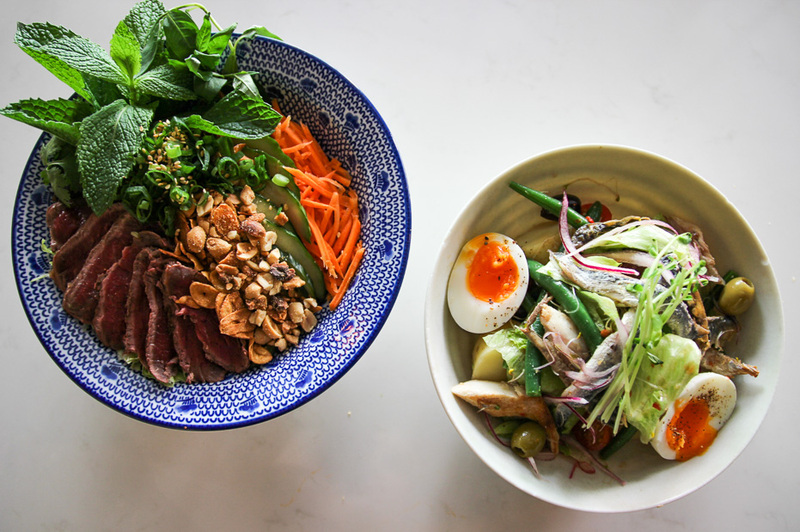 Full of interesting salads, traditional Vietnamese and French snacks and delicious fresh drinks, you’re sure to find something on the menu you haven’t tried before. We were invited in to try the new lunch menu shortly after its release and, now, we are here to report back on the exotic midday journey we were taken on! Our friendly waiter started us off with two refreshing, non-alcoholic concoctions: The Pokka Cleanser and Watermelon Juice. 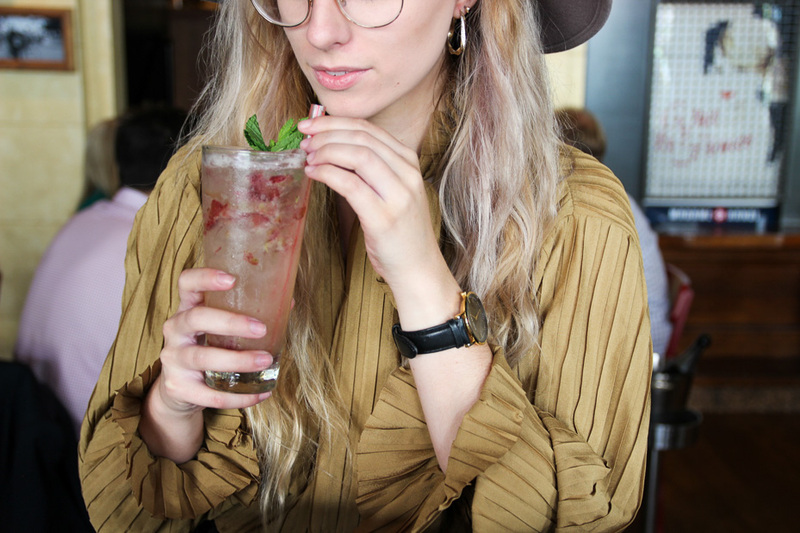 The Pokka Cleanser is ridiculously more-ish, offering a fresh and bubbly mix of mint, grape, apple and soda water, while the rich red-orange coloured Watermelon Juice combines Thai basil seed, lemongrass, watermelon and mint. Muc Sua Chien Gion was our first dish of the day: fried baby squid seasoned with smoked chilli and a slice of kaffir lime on the side for dressing. The squid was salty and crispy with just a hint of heat from the chilli, and we had a bit of fun playing around with Madame Hanoi’s hot sauces to spice and/or sweeten up the squid. Next, we indulged in an all-too-familiar lunchtime favourite, Bahn Mi Thit. Crispy pork belly, pickled carrot, pickled cucumber, pâté and coriander dressed with hoisin sauce filled the soft bun. There was the perfect amount of crunchy crackling and chewy fat to compliment the soft pork, making for a top notch bahn mi. On this menu you won’t find any boring caesar salads or tossed greens. Instead, we sampled the Bun Thit Nuong Kangaroo and the Xa Lach Nicosia. The Bun Thit Nuong Kangaroo is, as the name suggests, a salad built around highlighting the rich flavour of seared kangaroo. With the tender kangaroo meat artfully arranged atop rice noodles and asian salad, dressed with crispy shallots and smoked nuoc nam sauce, this salad was the perfect balance of sweet, salty and fresh. Needless to say, it was a real winner for us. The Xa Lach Nicosia puts a Vietnamese twist on the traditional French salade nicoise. Keeping the original ingredients of anchovies, tomatoes, hard-boiled egg and olives but adding mackerel, green beans, red onion, potato and smoked fish sauce instead of olive oil, this salad is unlike any other we’ve had before. There are a lot of elements in this dish and the fish flavour comes off strong, so if you’re not a fan of full-on fishiness this probably isn’t the dish for you. Finally, the toastie to end all toasties. Another traditional French dish, a croque monsieur is a fried ham and cheese toastie that’s made a little bit fancy by adding ANOTHER layer of delicious gooey, melted cheese on top of the bread. The Madame Hanoi Croque Monsieur sandwiches pomegranate-glazed ham and emmental cheese between two thick sliced of toasted sourdough, before melting a top layer of cheese to finish this creation off. C’est ci bon!